Special Order Flexsteel "non-Latitudes" 5-8 weeks and Flexsteel Latitudes 2-3 weeks approximately if at stock at manufacturer's warehouse. Call store for details 618-233-0667. 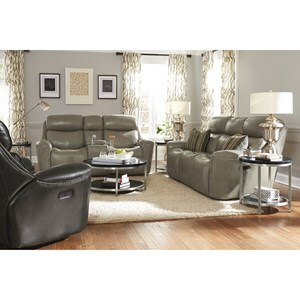 The Latitudes-Grover Reclining Living Room Group by Flexsteel at Mueller Furniture in the Lake St. Louis, Wentzville, O'Fallon, MO, St.Charles, St.Louis Area, MO Furniture Store and Belleville, Shiloh, O'Fallon,IL area. Product availability may vary. Contact us for the most current availability on this product. Fabric Options Available as shown in Dark Brown Leather Match. Tailoring Crafted using beautiful, natural leather which is enhanced and softened using the latest technology. Each hide is hand finished, hand rubbed, or hand wiped to add distinctive character. 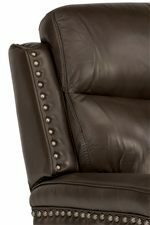 Arm Type Track arm decorated with nail head trim and wrapped with a sleek pillow for style and comfort. 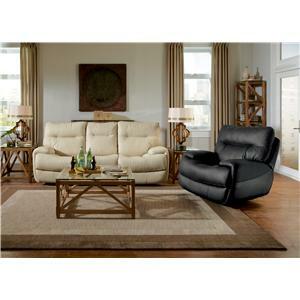 Warranty Lifetime Ltd Warranty on Spring, Cushion (luxury, feather comfort & plush), Recliner Mechanism and Frame. 5 Yr Ltd on Sleeper Mechanism. 1 Yr Ltd on Fabric, Leather, Deluxe Cushion and Metal Mechanical Parts. Frame Construction Moisture resistant cross-grain laminated hardwood frames for maximum strength. Dado-cut overlapping joints reinforced with additional hardwood blocks. Base rail joints further reinforced with corner blocks that are glued and screwed into place. Padding & Ergonomics Tailored seats designed for exceptional comfort are composed of a high-resiliency, high-density polyurethane foam core wrapped in layers of soft polyester fibers. Seat Support This exclusive, lifetime-guaranteed blue steel seat spring delivers unmatched comfort and durability. And, unlike eight-way hand-tied springs, it never needs retying or replacing to keep you from getting that sinking feeling a few years from now. Dualflex spring system marries our Blue Ribbon Seat Spring with new, resilient helical coils inserted into a strong, highly durable steel frame. 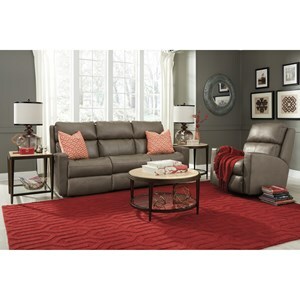 This stylish collection will bring comfort and luxury to your living room. 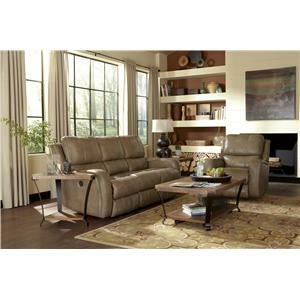 Smooth, leather match upholstery covers plush padding used throughout collection, creating a invitingly cozy place to relax with your loved ones. Nail head trim adds a traditional, masculine touch. 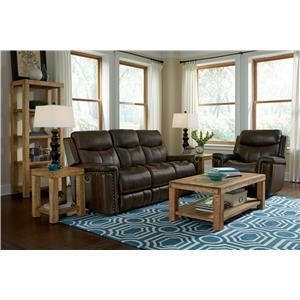 Recline with just the touch of a button with these power recliners. 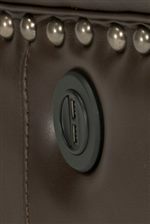 Optional USB ports in the arms are available for an additional charge. 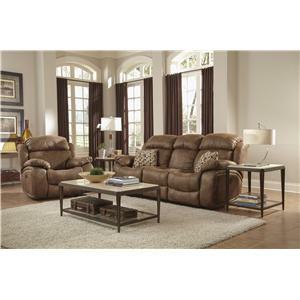 The Latitudes-Grover collection is a great option if you are looking for Transitional Contemporary furniture in the Lake St. Louis, Wentzville, O'Fallon, MO, St.Charles, St.Louis Area, MO Furniture Store and Belleville, Shiloh, O'Fallon,IL area. 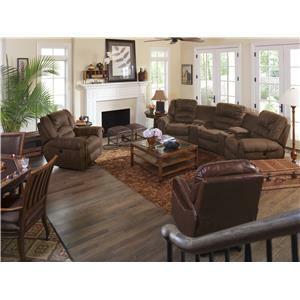 Browse other items in the Latitudes-Grover collection from Mueller Furniture in the Lake St. Louis, Wentzville, O'Fallon, MO, St.Charles, St.Louis Area, MO Furniture Store and Belleville, Shiloh, O'Fallon,IL area.